A number of feeders are available for a range of animals. Below are some examples of the models available. Please contact us for more information on the feeder you are looking for. UNO food hoppers with holders are also supplied as individual units to be installed in dog pens by the owner. The food hopper holder can be locked in position and swung out to avoid any and all contact with the animal. 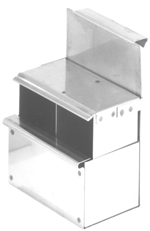 The detachable food hoppers are 120, 240 or 330mm wide. The 240mm holder will accommodate two 120mm hoppers.